Editor’s note: Our author was born in Iran and came to Afghanistan with her family as a child. This is the first part of a series on her growing-up years. The first time my family left Afghanistan was during the civil wars of the Mujahideen in the 1980s. My parents emigrated to Iran. I was born there, and in 1994 I had just finished first grade when my family decided to return. At the time, Ismail Khan was the governor of Herat Province. I had never seen Afghanistan and had no idea where we were going. My parents warned us that conditions would not be as good as in Iran. They did not want us to have high hopes. They were right. Our journey began in the United Nations camp where we had to spend the night after submitting our legal residence documents to the Iranian government. We came by bus to the Afghan border. From there it was a long, dusty car ride on a road filled with potholes. The driver had to keep one of the windows open because it was very hot inside and the car had no air conditioner. The car was filled with dust. Besides my mother and father there was my older brother, my two sisters and me, and two of my siblings and I had motion sickness the entire way. My mother’s black veil turned khaki colored. Our eyelashes were coated with dust. I could feel the sand between my teeth, which made me sicker. I could see vast deserts and endless dusty roads. Along the road, children in torn clothing extended their hands in hopes a car would stop and give them money or a piece of bread. I was eight years old, sick and exhausted. These heart-wrenching scenes made me think we had arrived in hell. When we reached Herat, it was night; the city was in massive darkness, dead and quiet. There was no power in the city. My mother gave the driver my aunt’s address. The car stopped in the street; we walked through scary, covered alleys to get to the door. We knocked and someone with a lantern opened the door. This was my introduction to life with a lantern, without electricity, clean water or good food, and later to insecurity and danger. It took us a long time to find our way in this ancient city and to learn what we needed to know to survive. My father rented a shop far from the city center and began doing carpentry. He also started building our house, spending all the money he had brought from Iran. We stayed with my aunt until he finished the house six months later. We were hopeful that life would show us a happy face, but life had others plans. Our new house was in Naw Abad, far from the city, on cheap land that my father could afford to buy. It was thirty minutes from the main road. There were a few other neighbors who had also come from Iran and built their houses there. We were happy to have some neighbors in this desert. A few months after we arrived, on a night filled with fear and gunfire, the Taliban reached Herat. From our house, we could see the hills where Ismail Khan’s forces were fighting the Taliban. In the morning, the gunfire stopped and we learned that Khan and his comrades had fled, and the Taliban held Herat. Many people were happy because they believed this would be an improvement over the previous corrupt government and the poverty in which so many people lived. They thought the Taliban might be a better option and bring a better government. But they were wrong. The story will continue in Living With The Taliban. You have left me spellbound! I cannot wait for the next chapter. You have a book in the making. 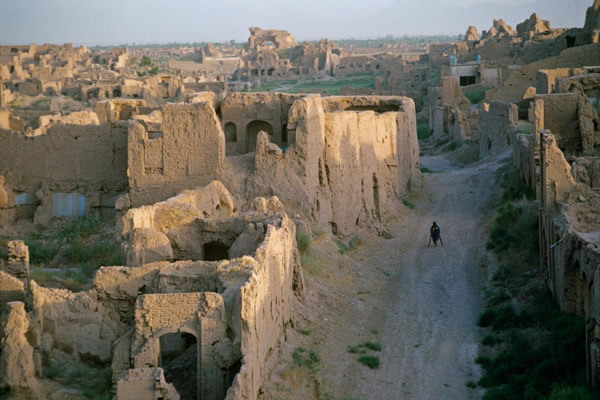 You create such a vivid picture of what it was like when you returned to Herat — one that I cannot find anywhere else. I agree with Liz! I’m so excited for the next installment to go up — and I can’t wait to read the one after that, and after that, and so on. What an excellent description of the journey, your return, and the coming of the Taliban.. I am glad to see that you continue to write very strong, sensory-filled, emotional work. Your story “Mother, I am dying, buy me an apple.” has stayed in mind for years, ever since I read it when you were in my workshop 3 years ago. More Americans need to get out of this country and see how the majority of the world lives – it is not like us. Yet our own insularity leaves us small minded and unable to understand the complexities of other people’s lives. Perhaps we would do less shooting and more talking if we did. Your story helps us understand some of what it is like in Afghanistan, where we have made yet another mess. Continue writing to educate us all. This is wonderful. I was on the edge of my seat reading the piece. I cannot wait for the next installment. I hope that this is an introduction to something that may, someday, turn into a much larger piece of literature. A book maybe?